FG Orders Repair Of Collapsed Taraba Bridge – Royal Times of Nigeria. The Federal Government has ordered a contractor to fix/repair a bridge which collapsed in Maraban Gassol, Taraba State immediately. 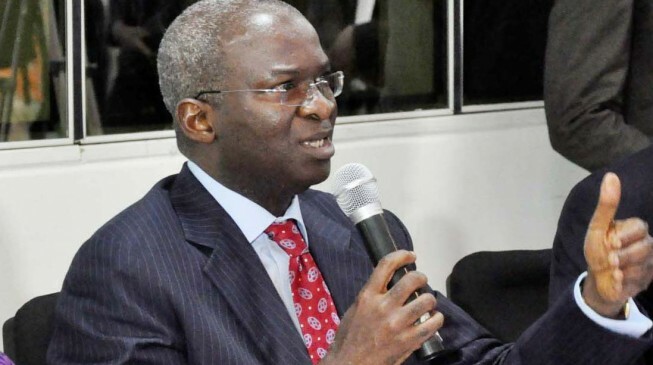 Minister of Power, Works and Housing, Mr Babatunde Fashola, disclosed the directive in a statement by the Director of Information at the ministry, Theodore Ogaziechi. The bridge, which links Jalingo, the state capital, to Wukari and further into Benue State, collapsed on Wednesday during a downpour in the area. Fashola directed the Federal contractor on that axis to mobilise immediately to the site and commence emergency remedial works on Thursday, in order to normalise the flow of traffic in the area. He also advised motorists to use the alternate route through Jalingo – Garba Cheda – Bali – Takum – Katsina-Ala. Meanwhile, the Corps Marshal of the Federal Road Safety Corps (FRSC), Dr Boboye Oyeyemi, has deployed road marshals from Mutum Biyu Unit Command to divert, control and ease traffic on that route. The minister noted that motorists and the public would be informed of further developments on the route as work commences immediately.